Liverpool overcame a huge hurdle as the challengers of the Premier League title registered a crucial win against top four chasers, Chelsea. This helped to keep pace in the title race and saw them regain the two points lead at the top, having played a game more than Manchester City. The first half was relatively a cagey affair and both, Liverpool and Chelsea were nullifying each other. Neither side of the two broke the deadlock. However, the second half began in a stunning fashion for the hosts as in form forward Sadio Mane scored with a headed finish from a close range on 51st minute via a wonderful delivery by Jodan Henderson to give his side an all-important lead. 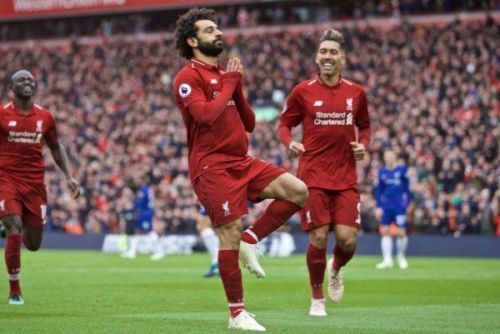 Just two minutes later, the exquisite stage for Anfield witnessed something remarkable when their star Egyptian found the back of the net with a thunderous left-footed strike from the long range. It was a brilliant and well-taken shot. Surely, it was going to be a strong contender for the goal of the season. This could become the highlight moment of Liverpool's 2018-19 campaign and it was delivered by their of PFA Player of the Year. It was also Salah's 19th goal in the EPL this season. That made him the joint top scorer in the division alongside Sergio Aguero. Unsurprisingly, the supporters all over the world reacted heavily to Mohammed Salah's stunning goal and here are some of the best Twitter reactions for this memorable event. Salah has 22 goals and 10 assists this season.